Home » Tips » She Found a Rubber Band on Her Door Handle. The Reason Why It Was There is Terrifying! every 15 seconds. A surprising 30% of burglars enter homes through unlocked doors, windows or other openings without having to use force to get in. For those of us who are sure to lock up, the chances of experiencing a break-in can still be worrisome to think about. The lengths that burglars will go to in order to get in a door can be pretty scary, and one woman has decided to share her story in order to raise awareness about protection from burglary tactics. A woman living in Texas named Kim Cernigliaro had a close call with burglars who were trying to enter her home. She was home alone when she heard someone pounding on her front door. Her instincts told her that something was wrong, so thankfully, she chose not to open the door. But when she peered through the stained glass in her door, she saw the silhouette of an unknown man standing outside. Kim waited about 30 minutes before making a move, to ensure that her unexpected visitor was long gone. When she finally opened her front door, she found a rubber band wrapped around her doorknob. According to Kim’s local Sheriff, this is becoming more commonly seen in burglaries. 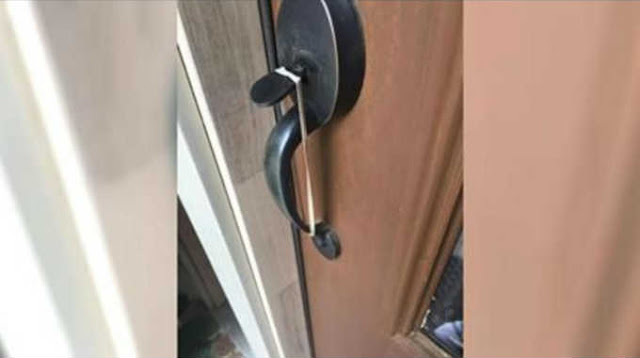 Burglars place a rubber band around the door knob, allowing them to barge into the house as soon as the home owner unlatches the door, without having to wait for the home owner to actually turn the knob. Kim shared her experience on Facebook in order to spread awareness, and her post went viral. With well over 150,000 shares on the popular social media site, others have thanked her for sharing her story. Being aware of different approaches that burglars take is important to staying safe. Leaving mail or discarded items outside your home can give burglars valuable information. If you’re going away for a few days, ask a neighbor or a friend to collect your mail for you and pick up the newspaper from your yard, to make sure burglars don’t know the house is empty. Consider investing in a home security system. They can get pricey, so if it’s not in the budget right now, display a few home security signs in the front of your property so burglars will think you’re protected. A dark home is the perfect target for burglars. No one will see them attempting to break in — or running away with a stash of your belongings when they leave. If your house is well-lit with porch lights and yard lights, it will better deter criminals from targeting your home. A jewelry box is an immediate go-to for burglars. If you want to keep your valuables safe, keep them in less obvious places, and makesure they can’t be seen through a window. An unstable door makes it that much easier for burglars to get into your home. Reinforce your doors and add more secure locks to make sure that unwanted criminals stay out.